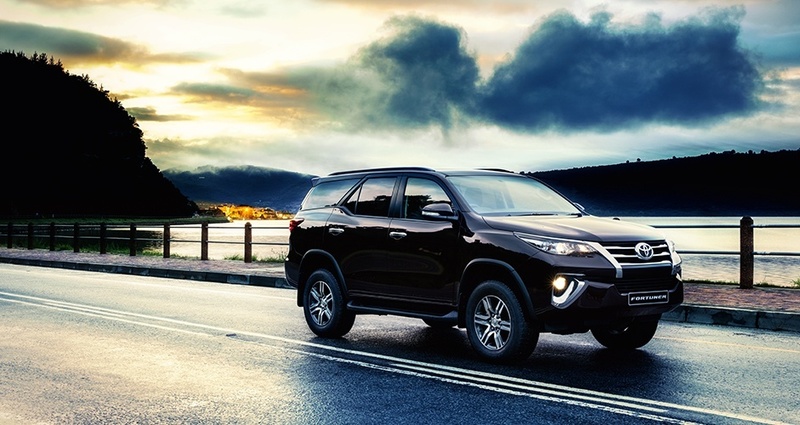 The all-new Toyota Fortuner redefines freedom and eschews a purely utilitarian presence for cool new styling, an additional helping of luxury features and a refined drive, while still epitomising strength and genuine all-terrain capability. Fortuner’s lineage is an interesting one: the SUV derivative of Hilux began life in 1998 with the introduction of the Hilux Sport Rider which was built in Thailand and initially sold only in selected Southeast Asian countries. In 2005, however, this model went global (selling in 110 countries and produced in 11), started distancing itself stylistically from its Hilux stablemate and became known as Fortuner, earning admiration around the world for its impressive quality, durability, reliability and off-road ability. The Fortuner name evokes an image that is strong yet active, allowing it to cross borders easily to be accepted by people around the world. 2016 celebrates the long-awaited South African debut of Fortuner’s first full-model change. Sophistication and refinement on the other hand is reflected in the detailing – slender headlight clusters that are scalpeled into the front fenders, the slanted chromed grille with plating extending around the headlamps, the three lines that score the sculpted roof line and flanks as well as the sleek rear combination lamps and license plate garnish that blend with the complex surfaces of the rear body. Ample cabin space is complemented by superb convenience features, culminating in a sublime driving experience. 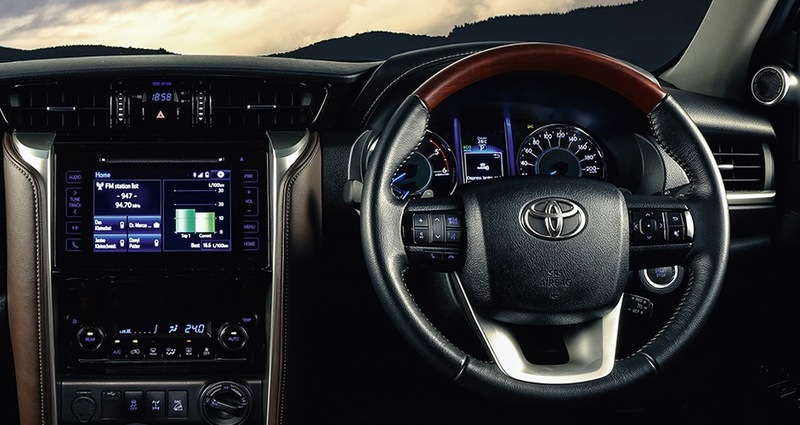 The new Fortuner’s interior exhibits the toughness of an SUV, tempered with the elegance of a premium sedan. A focal point of the dashboard architecture is the vertical center cluster flanked by columns of soft simulated leather upholstery that offer leg support from both sides. In fact soft-touch textures and exquisite chrome detailing liberally pepper the cabin; all beautifully harmonising with the clear blue interior illumination, including an ambient lighting function. Other innovative touches (model dependent) include a tablet-inspired multi-media, touch-screen display that allows easy operation of functions, a Smart Entry & Start system, an electronic 4WD switch and second-row seats with one-touch operation for ease of folding. The third row seats are equipped with a fixed hook attachment for simple and convenient stowage. There are no fewer than 15 storage areas in the new Fortuner. On the ride and handling front, an all-new frame bolstered by cross members, side rails and suspension towers that have all been strengthened, enhancing the torsional and bending rigidity of the frame. This not only improves durability, but also drive quality and safety. The suspension uses a double wishbone (front) and a four-link suspension (rear) combination that has been redesigned for optimised comfort. An additional rear stabiliser has been installed to aid on-the-road smoothness and stability. Newly developed 2.4- and 2.8-litre diesels are highlights of the new Fortuner engine range, supplementing the petrol variants (details to be disclosed closer to launch). Low-speed torque has been greatly improved. In addition to achieving higher power at all engine speeds, the new units boast improved fuel efficiency and cruising range as well as reduced engine noise. Propping up these efficient powerplants are the newly developed six-speed automatic transmissions with more steps and optimised gear ratios to maximise engine performance. As with new Hilux, stick-shift Fortuners are equipped with the Intelligent Manual Transmission system (i-MT) supporting smooth shifting with rev matching technology. The fourth pillar of the new Fortuner is safety, therefore the new model comes with a full suite of safety technology including both active and preventative systems such as kneebags and Hill Start Assist, to mention just two of the safety extras on offer. Please note that the all-new Fortuner launches in South Africa during the second quarter of 2016. Full local range and specs will be disclosed closer to launch timing.